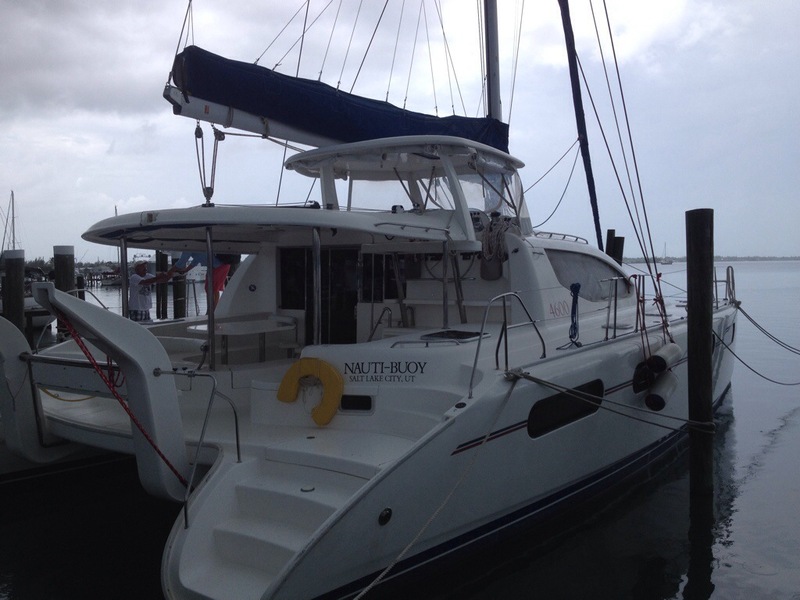 Yesterday we arrived in Bahamas to see Nauti Boy. And today we’re taking Knot Anchored back to Ft Lauderdale! Yay! 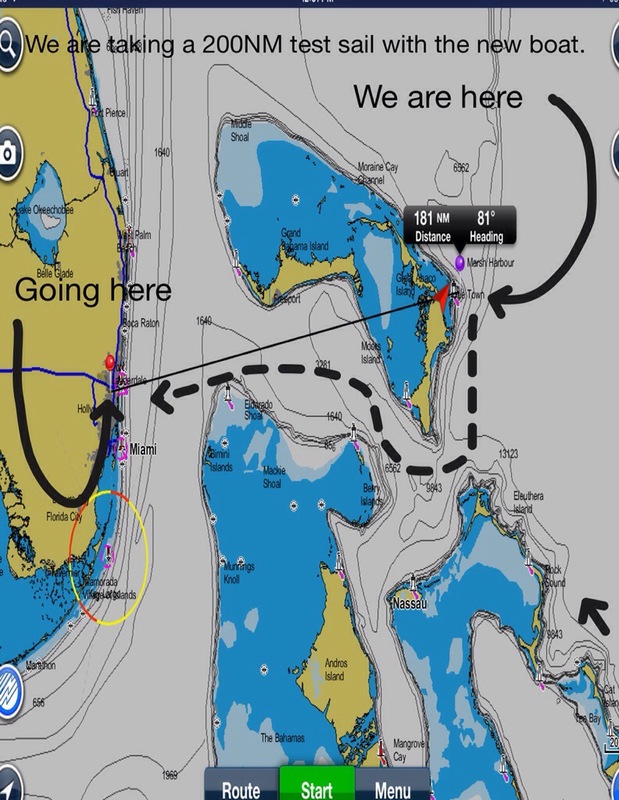 This is about a 24 hour 200 nautical mile trip. Last night we spent our first night on a catamaran. Today we did our provisioning for the trip and in a couple of hours we head out. Here’s the route. Steve already has upgrades planned for the boat and Ft Lauderdale is where we will do the fit up. We are joined by our very patient broker Wiley from Denison Yacht Sales who has been instrumental in the process and inevitable closing of our yacht. Thanks Wiley! Noteworthy: be advised if you are ever flying into Bahamas on a one way ticket you will not be met with enthusiasm by Bahamian Immigration. Good sailing you guys…be careful! Powered the whole way – I guess Tropical Storm Bertha took all the wind with her! So exciting! Safe travels and have a blast! Sorry don’t know any Laurie Anna lol! Knot Anchored is back in Florida for upgrades, we’ll give you a shout when we hit the islands end of Sept.
No thankfully no sharks! But it would have been cool to see a pod of blackfish from afar! POWERED ALL THE WAY- BY LOVE. I almost envy you both. Misia. ROBBIE – if you know what’s good for you, you will return loaded with lobster and rum. With you, not in you. Misia. p.s. And you will hang on to the beautiful young lady you have in your life. When your grandmother loves someone as much as she loves Leanne, you are blessed. For all you lucky children, your mother is a blessing. Live your life, guided by LOVE. Be a fool for authentic love. Like the one who gives so much, who leads you with her life. Rejoice that she has such a man in her life, gift to all of you. A man who comes from a loving family. And to you Chelsea, you seem equally blessed by Lorenzo. This is a blessing to your grandmother. And Jacob, your are my rock. I am so impressed with your attitude to life. I can’t wait to see you again. Let me know when you can be with me again. LOVE, GRANNY. Love your forever. p.s. To all of you, you are always with me. LOVE TOO MUCH TO SAY IN WORDS. Stevan, again, you are the carbon copy of my father. GOD BLESS. Basia.